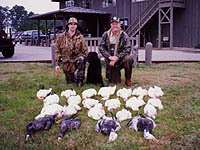 Editor’s Note: Jack Brittingham hunts all over the world, and he has hunted for geese all his life. This week Jack will tell us where he likes to hunt, what geese he likes to hunt, and what equipment he uses, as well as tips and tactics that can make your goose hunting even better. I like to hunt geese in Canada and on the Texas coast. Hunting on the Texas coast involves a massive decoy spread. We incorporate full-body decoys, silhouettes and plastic windsocks. Our spread will contain 400 or 500 of these combinations of decoys. Manufacturers make a number of calls for snow geese, but I use my voice. Some people may not be able to hit the high notes, but for me I find it more convenient. Usually we have six to eight hunters calling together. When they first came out with electronic calls they worked like magic. But the snow and blue geese are some of the smartest geese, and electronic calling is not what it was three or four years ago. The geese that have survived the gauntlet from Canada to the Texas coast are smart enough to stay away from electronic calls. The Texas Department of Conservation is trying to decrease the numbers of geese to a more-manageable level. Currently, the limit is 20 birds-per-day. 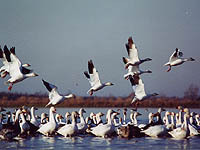 The continental population of snow geese is three times the necessary amount. For goose hunting I recommend a Benelli Super Black Eagle shotgun and a 3-1/2 inch Remington HEVI-SHOT size T.
It’s not uncommon to have shots on days when the birds aren’t decoying well of 55 or 60 yards. HEVI-SHOT is about the only load that will cleanly bring down a goose at that distance. I think HEVI-SHOT is one of the most-devastating waterfowl loads ever made. Before switching to HEVI-SHOT, we were using steel shots in size BBB. With Remington HEVI-SHOT, the density of the pattern rises almost 25 percent and the retained energy of the BB size is comparable to that of the BBB size of the steel shot. If you have geese flying, you have to take into consideration whether they’re flying upwind or downwind. If you have birds at 40 yards, and the wind is calm, you need to lead the birds 3 to 4 feet. If geese are riding a tailwind, you’ll probably want to lead another 18 inches, depending on the wind speed. Most hunters will be shocked, but to lead birds that are 55-yards away, you need to allow 10 to 12 feet. To get the birds to come in that have been called and hammered all the way down the flyway and through Texas, you have to find where the birds have been feeding several days in a row. It’s all a matter of pre-scouting. You don’t want to go into a field and try to shoot birds that have only been in the field a day or so. If you can find a field where the geese have fed the last three or four days, and have everything set at first light, you have a much better chance of taking geese. I like to hunt Canada geese in the province of Alberta, Canada, near Peace River, High Level, and Grand Prairie, Alberta. These areas can be great for the larger moffet subspecies of Canada geese. A big moffet gander will weigh about 12 pounds. Alberta is a summer home to many Canada geese because they like to nest further north, in the Canadian tundra and Alaska. When they begin their southern migration, these are the first places they see agriculture. Lots of communities in that region are farming communities that have taken out scrub brush and put in agricultural fields that produce peas, barley and wheat. For these birds, I’ll use from 50 to 100 decoys with a combination of silhouettes, shells and full-body decoys. Flagging is also a big part of our goose hunts. Even if you can’t call, you can wave a flag. We have one guy who is the designated flagger. The lesser-experienced hunters aren’t allowed to flag unless the lead guy does. The key to flagging is not to flag when the birds are close. You flag to get the birds’ attention. Then as they come in, you have to stop because they have excellent eyesight. For Canada geese, my two favorite calls are the Foiles Migrator Strait Meat Honker Call and the Eastern Shoreman by Sean Mann. These calls are easy to blow, and they allow for variations. It doesn’t take a lot of wind to blow them and they are reliable. They will not freeze up. 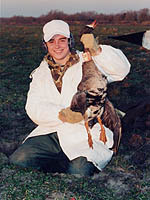 About 10 years ago, near High Level, Alberta, my friends and I experienced the best goose hunt of our lives. There were eight hunters. Over the course of six days, we each limited out on Canada geese. About 60 percent of the geese were the larger subspecies of Canada geese. Our group took 64 birds a day. It was at the same time as the harvest in the local area when the birds started migrating. The farmers were more than 75-percent done with the harvest. The birds came across the area in large numbers. 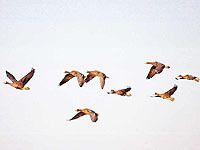 If the geese begin their migration before the farmers start harvesting, then the geese will blow right through a region. It made for an ideal situation. Every day we were out of the field in 45 minutes. My favorite recipe for Canada geese is to cut the breast out, and cut it into big chunks, maybe six from each breast. Marinate the breast in equal amounts of Italian dressing and Worcestershire sauce. Then, put the meat on kabobs with vegetables on the grill. You have to make sure that you don’t overcook the goose. Because of the limited amount of fat on these birds, you have to cut the cooking time in half. This is a delicious recipe. For great goose hunting action be sure to check out Jack Brittingham’s Ultimate Hunting for North American Waterfowl and Ultimate Hunting for Canadian Honkers.